Franco is slashing .222/.349/.333 across his first 43 plate appearances with Low-A Bowling Green. 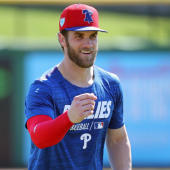 The line is partly comprised of three extra-base hits (two doubles, one triple), three RBI and seven walks, which has helped his OBP to a respectable level. Given his body of work in rookie ball at Princeton last season at just 17 years of age (.351/.418/.587 line across 273 plate appearances), the outlook for Franco's 2019 remains exceedingly bright. Moreover, Franco may be picking it up at the plate, as he's hit now safely in three straight games.